Prep for a flourish of colour in autumn by planting winter- and spring-flowering bulbs. Pruning hedges, deadheading roses and recycling garden waste is also at the top of the gardening agenda. Read our guide for what to tick off your task list this month. Plant in a sunny spot to ensure your bulbs receive sufficient sunlight. Soil should be well-drained and kept moist at root level. Plant all bulbs, except anemones, with the pointed side facing up. Bulbs with claws, like ranunculus, are planted with the claws facing downwards. Feed with bulb food every two weeks for maximum flowering. 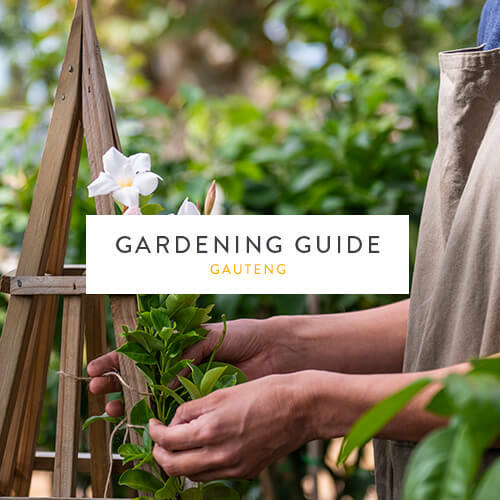 Plant easy-to-grow beauties such as calendulas, primulas, Californian poppies, pansies and violas, and the Namaqualand daisy. Sow sweet peas and vegetables such as broad beans, peas, cabbage, carrot, cauliflower, onion and turnip. Harvest root vegetables such as potatoes, beetroot and carrots, dry them out over a few days and then store them. Use magnesium sulphate to support the health of lemon trees. Feed aloes and succulents with Atlantic Bio Ocean. Feed your lawn with a fertiliser rich in potassium, such as Wonder 3:1:5 or Vigorosa 5:1:5, to build hardiness ahead of the cooler season. Apply acid compost and feed Colourburst to acid-loving plants such as camellia. Deadhead roses to encourage more flowering into the cooler season. Spike lawn areas where the soil is compacting to allow time to recover before the cold season begins. Check for psylla on citrus trees and treat with Efekto Aphicide or Efekto Oleum. Spray scales on roses, aloe and citrus trees with Efekto Malasol. Use chemical-based Efekto Snail Ban or organic Biogrow Ferramol for snails in vegetable gardens and on plants such as arum lilies and agapanthus. Create a pest-free home environment by using Protek Nuvan Profi Fumigation Fogger. Now is the best time to add shrubs and trees to your garden landscape. Trees that work well in small gardens include the false olive, lavender, pompom and cork thorn trees. Try your hand at indigenous, bird-attracting shrubs such as Cape honeysuckle, cross-berry and lion’s ear. Start a compost bin by mixing garden waste with fruit and vegetable peelings, weeds, grass cuttings, leaves and prune cuttings. Use a chipper or shredder machine to process woody stems and branches from shrubbery leaves. If you are unable to compost the waste at home, take it to your local garden waste recycling collection point.